The above quote is a reference (of course), to the current global shortage of rice for international trading purposes and to the sudden spike in rice prices (see a much fuller explanation of the whole issue in this companion post). James Adams is simply highlighting one possible step that can be taken, if not towards a complete solution, then at least along the road to an amelioration of what is likely to become - in some of the world's poorer regions - a very acute crisis indeed. But the issue of rice prices (and indeed of the whole structural rise in food and energy prices) is a complex one, and a lot of seperate factors come into play. Land use is simply one of these. Obviously the decision procedure facing farmers like Phantipa Chongrak is a complex one. To some extent they need to bet that the rise in prices is going to be more or less permanent (which it may well be) but they will almost certainly be doing this on the basis of very "imperfect information" since they do not have their disposal the sophistocated models and information which international economists can resort to (and god knows, we have a significant enough tendency to get things wrong). It has been estimated that the price increases may lead Thai farmers to cultivate up to 16,000 hectares (39,520 acres) of previously idle land this year, and , in addition, many growers plan to plant an extra crop. Rice growers and their families constitute a third of Thailand's 65 million population, and those who own their own land earn an average of 12,837 baht ($404) a month, compared with 33,088 for a Bangkok family, according to data from the National Statistics Office. Thai rice exports were up 36 percent from a year earlier in the first four months of this year, and the country may supply 45 percent of world exports in 2008, compared with 31 percent last year, according to the Commerce Ministry. Before the shortage, Thailand estimated it would produce about 20 million metric tons of milled rice this year and export about 9.5 million metric tons. The additional cultivation that is now envisaged may increase output by 660,000 metric tons - enough, for example, to supply Mexico's annual imports. But there are problems. Apart from the unpredicatability of future short term movements in prices, water is also an issue. Thai farmers normally plant in two crops: the main one around mid-year and the second near year's end. Now, they're planting at least three times, which means dipping into water typically saved for the dry season that starts in November. The Royal Irrigation Department said in April that reservoirs were at 64 percent of capacity, down from 71 percent a year earlier. It also warned against planting a third crop in two northern provinces, citing limited water reserves. Paddies have been guzzling 20 percent more water than normal so far this year, according to Theera Wongsamut, director general of the irrigation department. 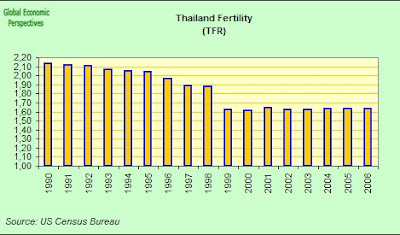 And there is also growing indebtedness among Thai rice farmers. The state Bank for Agriculture and Agricultural Cooperatives expects lending to rise 25 percent to 250 billion baht this year on increased demand from rice planters, according to bank President Thiraphong Tangthirasunan. Farmers are borrowing the money to buy equipment like water pumps since they are planting more while the water supply is limited. They are also busily buying fertilizer, seed and pesticides, and trading-in buffaloes for mechanized plows. So James Adams is right, many in Thailand are preparing to go that extra mile (and let's just hope for there sake that they don't need to "erect one bridge too many" to cover it). 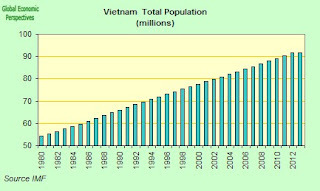 These growing labour shortages, which can to some extent be anticipated in any economy which is growing rapidly, are exacerbated in Vietnam by the fact that many potential workers - in a way which is similar to the situation which is to be found in Poland or Romania - now work abroad, whether as temporary or permanent migrant labour. 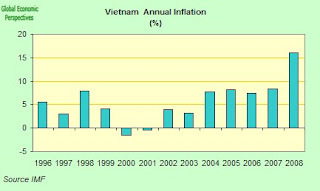 There is, however, one important difference between Vietnam and Eastern Europe in this regard in that Vietnam has an active policy of encouraging what they call "labour Export", indeed the Ministry of Labour has a whole department which is dedicated to the topic. The reason that this policy is persued is not hard to imagine. 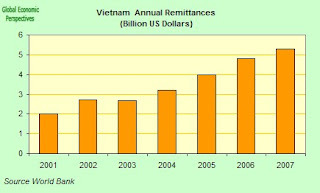 It is summed up in one single word: remittances. 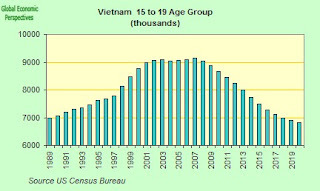 For 2006 the World Bank estimates that migrant workers sent home to Vietnam roughly $4.8 billion, or 7.5% of GDP. 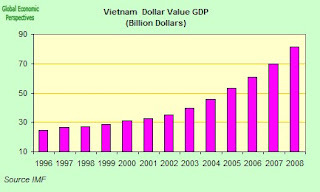 Of course such a sizeable flow of money has an impact in its own right on the Viet Nam economy, creating in its wake more consumer demand, and with this more demand for construction, and with this more demand for construction workers who, as a result of one of those many anomalous circularities we are able to identify here, happen all to be often to be working out of the country and are doubtless to be found among those actively sending money home. When you stop and think about it it isn't hard to see where all that inflation comes from here. 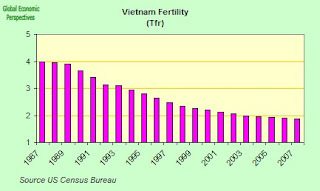 If the Western nations (who have the cash to really give it a go) cannot keep their fertility up through social engineering, we can safely say nothing can be done for Asia. Modernity leads to falling populations, QED. People are not machines; we can't force them to breed. But have no fears, natural selection will take over. It won't take too many generations of false starts before the world is slowly populated by the subset of religious and patriarchal humans who have proven breeding metrics. Leaving aside the possibility that the sort of cultural engineering necssary for above-replacement fertility, it is not immediately obvious to me that said religious and patrichal cultures are necessarily resistant over the long haul. Poland seems to be the clearest example of this kind of phenomenon, with a Roman Catholic Church that has acquired a central role in Polish life and a broadly conservative social and political life generally, but it hasn't escape the sub-replacement fertility trap--if anything, those demographic age groups and regions most closely associated with these same conservative ideologies. Any selection effect would oprate in the direction of the young. Among the Amish, very careful cultural engineering was necessarily for the group's very high completed fertility. That said, two hundred thousand or so<= Amish out of an American population of three hundred million or a German-American population of fifty million isn't exactly proof of Amish success. The Amish form the majority of the population of speakers of out of an American population of three hundred million or a German-American population of fifty million isn't exactly proof of Amish success, even if the Amish do form the majority of the population of speakers of Pennsylvania German. Will the sort of social engineering that the Amish, or other groups, continue to work as these groups become relatively larger? I have my doubts. The Mormons of the mid-19th century started off as a hard-core sect (its members were willing to go to isolated Utah) with values radically at variance with those of their contemporaries. Utahn women in 1994 did exhibit a TFR of 2.68 versus 2.05 for the United States as a whole, but that difference isn't going to ensure a Mormon majority. Randy, it is not immediately obvious to me that said religious and patrichal cultures are necessarily resistant over the long haul. I don't think that every religious and patriarchal culture will make the cut, merely that this is a bare minimum requirement. But regardless, your Poland example doesn't wash; they are not very religious and certainly not patriarchal. ...this is all we need to see the future, which belongs to those who show up for it. It doesn't matter if the only breeders past replacement have a TFR of 2.11, and one goes extinct every decade and is replaced by another, they eventually dominate over the secular 1.5. We don't need to look at each individual case. Regarding cultural engineering: it can work only if you found a way to make a culture more religious and patriarchal. But this won't happen in modern, secular, individualistic Europe anytime soon - they are quite hostile to both. (It will probably happen willingly, inside Europe, in a Darwinian sense with the local religious replacing the secular, but will most likely be too little too late compared to immigration). And the data backs this up: every attempt at social engineering to get people to breed past replacement rates in modern cultures has failed. I think you are wrong to say that all non-patriarchal and secular peoples are below 2.1 . I can name atleast 2 groups for which i believe that they have amuch higher TFR than the rest of the population. First group is the very wealthy, but this by definition a small group. Second group is "teenage welfare mothers". ps. I also wonder about TFR in families with a lot of twins. "I don't think that every religious and patriarchal culture will make the cut, merely that this is a bare minimum requirement. "But regardless, your Poland example doesn't wash; they are not very religious and certainly not patriarchal." That's a bit of a surprising thing to say. Poland easily ranks among the in terms of belief in a supreme being of some sort, Poles seem to be one of the nations most given to practicing their religion, and Roman Catholicism has been central to Polish national identity for centuries. What's more, in addition to the economic gap between a "Poland A" in the west and centre of the country and a "Poland B" in the east, there is a significant cultural gap, with the late Kaczynski government drawing its support in "Poland B" and including a variety of explicitly Roman Catholic/conservative parties, including some whose members wanted to make Jesus Christ the eternal king of Poland (a tenth of the parliament's members, for whatever it's worth). As for feminism, suffice it to say that, compared to the situation in most western European countries, feminism in Poland isn't doing all that well. Poland is both religiously conservative and relatively patriarchal in the European context. Where is its demographic ascent over its European neighbours, or, at least the demographic ascent of "Poland B"? ...this is all we need to see the future, which belongs to those who show up for it. 1. These long-term projections tend to change quite radically. See the League of Nations projection of 1928, which projected a French population of 29 million by 1985, versus the actual number of 55 million. Cultures can change quite quickly. 2. People in other cultures seem willing to make the same decisions as Europeans. Morocco's rapid transition to below-replacement fertility, between economic growth and female education, is a case in point. If the CIA World Factbook is to be belief, Algeria and Tunisia have made the transition to below-replacement fertility rather swiftly. Cultures can diffuse. 3. Did the relatively strong population growth of the Soviet Union in the 1970s compared to West Germany guarantee West Germany's eventual surrender? No. Non-demographic factors intervened. 4. It's far from obvious that religious and patriarchal cultures are that adaptive to their environments. Take Yemen, one of the few countries where one can publish a serious article entitled "There must be violence against women". Yemen has strong population growth; Yemen also has has growing chaos at every level of society and doesn't seem to have any means to sustain its economy apart from migrant labour (to where?). Yemeni culture as it exists doesn't seem especially adaptive to its environment. Surely this would qualify this culture as unfit? 5. Cultures are engineered all the time. When I go to restaurants in Toronto, I can't smoke, for instance, or if I'm in Québec I can send my child to a state-funded daycare while I work instead of just working, or ... Why is it easier to create religious and patriarchal cultures than not, especially given the rapid decay of those cultures once enforcement mechanisms are removed? "(It will probably happen willingly, inside Europe, in a Darwinian sense with the local religious replacing the secular, but will most likely be too little too late compared to immigration)." If I've said it once, I'll say it again: The Romanians, and Ukrainians are not going to convert Europe to Orthodoxy and the Ecuadorians and Bolivians aren't going to impose a reverse-hegemony on the natives of Europe. Oh, and there's no need to worry about the Muslims, in case you were worrying about that. And the data backs this up: every attempt at social engineering to get people to breed past replacement rates in modern cultures has failed. Every coercive attempt, yes. Non-coercive attempts, now, do influence things: Much of the gap between France and West Germany can be explained by the fact that Frenchwomen can combine work and family considerably mroe readily than their West German counterparts (paper here). "But it does not follow that everyone will go extinct with them. Natural selection will take over. Watch this if you doubt this..."
It's really, really simplistic to say that religious and patriarchal cultures are going to triumph. Apart from the relative paucity of such cultures, they're just not stable once their enforcement mechanisms are removed. Unstable cultures that just aren't that successful--compare Tunisia with Mauritania--aren't especially "fit." My apologies for my spelling mistakes in the post above. The question of whether these small communities will be able to retain their in-group solidarity as they grow is an important one. Ethnic and religious difference might only delay the shifts--the demgoraphic experience of French Canadians, a population that retained high rates of natural increase until a relatively sudden drop in the 1960s again, comes to mind. Can the Amish do any better? The big difference between religious and non religious groups is their view one anti conception. You get a TFR rate in the high single digits if you don't use any anti-conception methodes. This rate is way to high for a modern lifestyle and would lead to poverty. So any religious group that whats to be part of the mainstream needs to allow anti-conception. Problem with that is that when you allow that than there is no difference between having 2 kids or 4 kids. And 2 kids is the more economical wiser. Which leads to a situation that when everything has settled down were religious and patriarchal groups will be outbred by the non religious because they have unwed mothers etc. Regarding the Amish, their retention rates are higher than they've ever been (90% or more) despite increasing contact with the outside world through tourism and a shift from farming to manufacturing work among Amish males. I agree, though, that their curent rates of demographic expansion can't be projected with confidence into the future. Having said that... there is a fundamental problem with modern civilization, in that it encourages people with the highest cognitive ability to put off breeding while pursuing an education and a career, while those with low cognitive ability have less reason to postpone or avoid childbirth. An analysis of data from the National Longitudinal Study on Youth in 1990 suggests that women with IQs below 90 had 33% of all children born in that year, while women with IQs higher than 110 had 15%, despite the fact that the two groups of women are about equal in size. Intelligence is between 40% - 80% hereditary, depending on whom you speak with. This is a problem. Sooner or later, IQ scores are going to stop rising as we wring the last gains that we can out of improved environments. In fact, they already have stopped rising in some western countries such as Denmark. After that, we're in for a slow slide in average cognitive ability, as hereditarian factors take over. This is also why I can't get on board with the whole "migration from high fertility to low fertility countries will mitigate the demographic crisis" meme you seem to be pushing. It ignores the possibility of different average levels of cognitive ability among different, historically seperated population groups and the long-term implications thereof. I commented on this before and my comment was deleted, but I'll give you all the benefit of the doubt as scientists motivated by data as opposed to dogma and try again. We know that among individuals higher levels of cognitive ability correlate with economic success. It is also well established that there are differences in average levels of cognitive ability among different groups, as shown by consistent gaps in average scores on IQ and other G-loaded tests. These differences do not go away when you control for socioeconomic status. They do not even go away in cases of transracial adoption: The variance in average cognitive ability that we see in general society among East Asians (high), whites (middle) and blacks (low) is also found among adults of all races adopted by whites as children. The one gene variant that is *known* to increase intelligence - the C538T polymorphism on the SSADH gene - is not evenly distributed among the four populations sequenced in the hapmap. The IQ-boosting variant is found more frequently among the Japanese and Chinese than it is found among northwest Europeans, and more frequently among northwest Europeans than among Nigerians. If you don't believe me, head on over to ensembl.org, put in rs2760118 for the SNP, and see which groups have the highest percentage of T alleles. (Google the SNP tag yourself if you want to see the studies conclusively linking the variant to increased intelligence, I'm writing this on the fly on my way to work.) None of the other candidate variants whose effects have yet to be confirmed are equally distributed among the four populations either. The T allele on rs3624650 in the CHRM2 gene is the most likely of these candidate variants, since its effect has been replicated across studies, though we can't say for certain that it isn't tagging the causal variant because we don't know what it does. Plug that SNP into the database at ensembl.org. You see the same pattern. The high-IQ allele is nearly fixated among East Asians (90%+), and nearly twice as common among northwest Europeans as Nigerians (47% vs. 27%). My point is that you can't just ignore or dismiss as racist the possibility of different average levels of cognitive ability among different ethnic and racial groups. The science has gone too far for that. Nor, in my opinion, can you ignore or dismiss the connection between cognitive ability and economic performance.